At JRMC, our audiologist will help you enhance communication – not only for patients, but for the lives of everyone with whom her patients interact. JRMC has the equipment to screen newborn hearing. The equipment is for Otoacoustic Emission testing. This is one of two newborn hearing screenings recommended by the federal government. 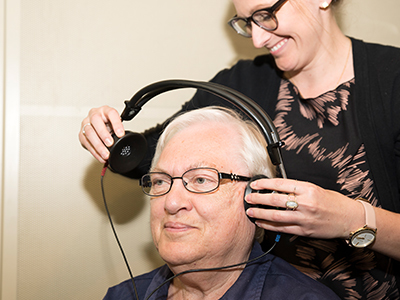 In addition to hearing screenings, a variety of assisted listening devices such as phone amplifiers, television listening devices, vibrating alarms, amplified smoke detectors and more are available as loaners for patients. The audiology department also offers hearing aid fittings and related services and supplies. call (701) 952-4800 or toll-free (800) 841-6340.